Often the best ideas are the simplest. Take this 40-track Sandy Denny compilation for example, which takes away her usual folk rock backing and instead focuses on her beautiful voice with the simplest of accompaniments of either acoustic guitar or piano. It’s such a simple idea but one that showcases the former Fairport Convention, The Bunch, Fotheringay and the Strawbs singer’s talents perfectly. The press release says this “is the best album that the late Sandy Denny never made”. I’m inclined to agree. Compiled here are a range of live radio and TV recordings and demos, including three exclusive tracks recorded at Richard Branson’s Manor Studios in December 1971 for The Bunch’s 1972 rock and roll covers album. It’s a career retrospective as well, with tracks from various other bands and solo career. Among the many highlights is a stripped back version of Milk and Honey, originally by her former boyfriend Jackson C Frank and released with fuller instrumentation on the 1967 Saga Records split album Sandy and Johnny, along with Johnny Silvo. This wonderfully emotive song really comes alive with just her vocals and guitar. This notion of the acoustic Sandy Denny being the best Sandy Denny is a theme that is carried throughout this collection, especially on one of the best segments, a three song set of just vocals and piano recorded at the BBC Paris Theatre. The title track from her solo album North Star Grassman and the Ravens in this segment is real hairs tingling on the back of your neck stuff. This is already my favourite Sandy Denny album, which showcases just how good a singer, songwriter and performer she was. 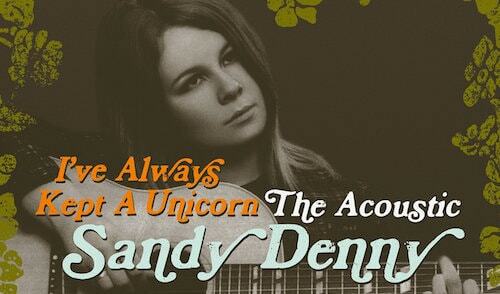 Sandy Denny – I’ve Always Kept A Unicorn – The Acoustic Sandy Denny is released on April 22.